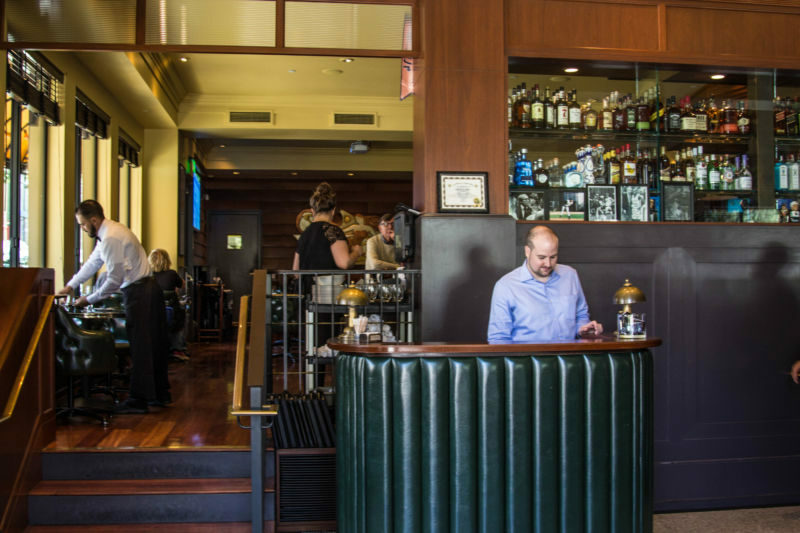 Believe it or not, we had only eaten once in North Beach since moving to The Bay Area. 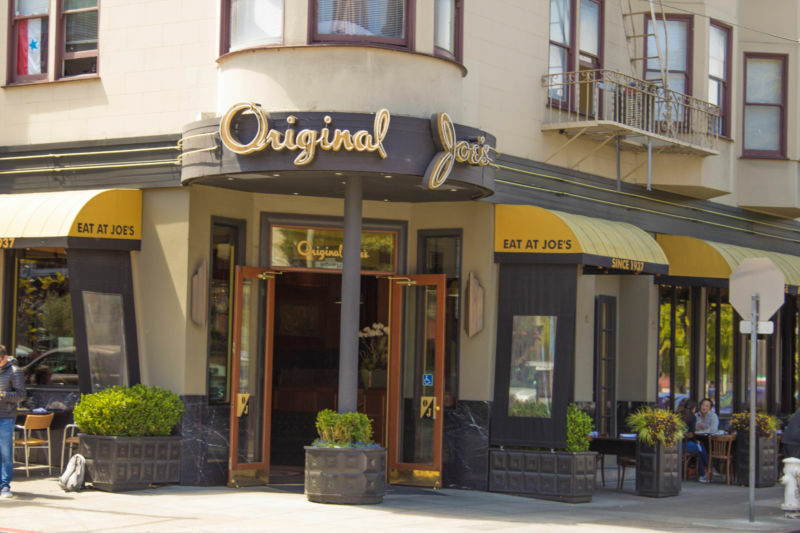 One Sunday, we ventured out, with two friends in tow, to eat at Original Joe’s before heading on to Beach Blanket Babylon. I will own it, I am an Italian food connoisseur (snob). I grew up eating the good stuff made by a real Italian grandma, so I get grumpy when things aren’t prepared correctly. Original Joe’s has been around for some 80 years, so my guess was that the food would be good. Well, Yelp said so too. Both were right on the mark. We arrived between brunch and lunch time. We were all undecided on which meal we wanted to eat, so we ended up with an interesting mix of food at our table between the four of us. We started off with cocktails, of course. 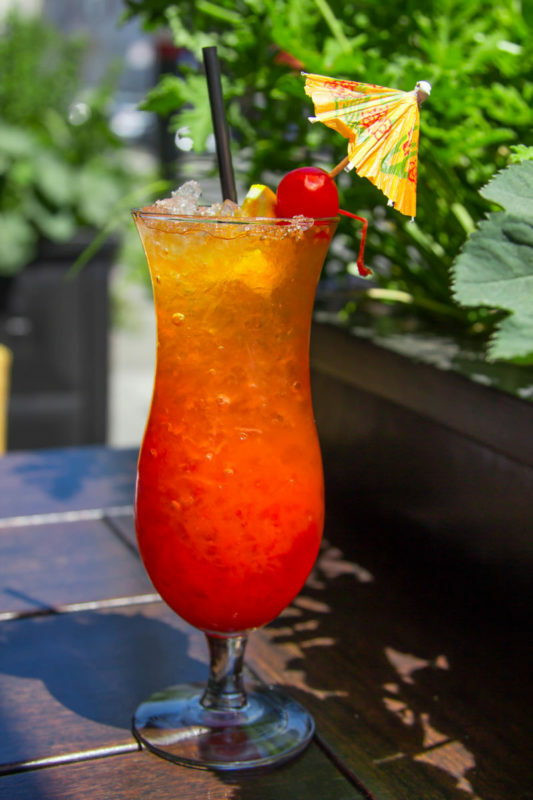 The Brit ordered a mimosa and the girls ordered a very fruity hurricane. Both were great, and the table was very mellow after just a few sips of each. They were nice and strong. The Brit comments: California Girl undersells my choice; it was not a simple mimosa. 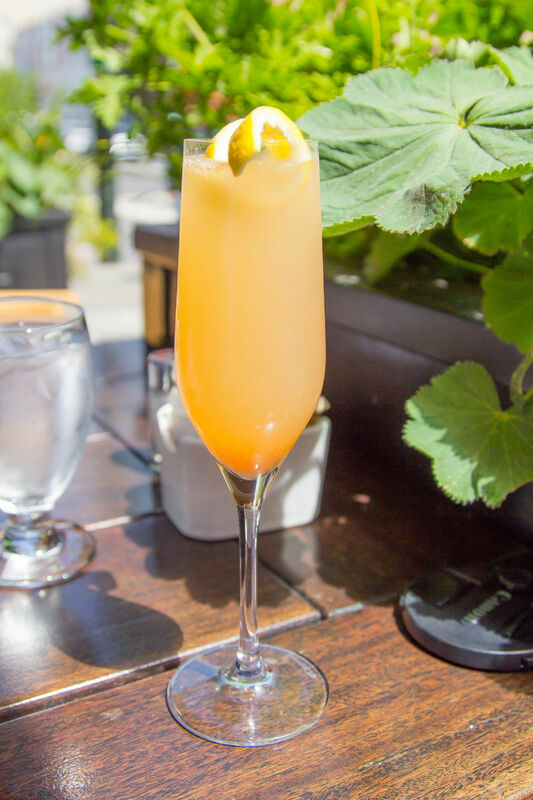 It was called “La Quintossa”; as befitted the Italian setting it was Prosecco, freshly squeezed grapefruit juice, and triple-sec. The balance of sweet, tart, and fizz was excellent. Then came the bread. Oh man, this is the stuff bread dreams are made of. Served warm and fresh with the perfect butter. Those of us who usually try to abstain, caved and we all ate it like it were starving; it was that good. I thought there would be a fist fight over the last piece. Thankfully, our sanity returned before a riot occurred at our table. As we were doing Italian I wanted to order something classic so I could really gauge the quality of the restaurant. 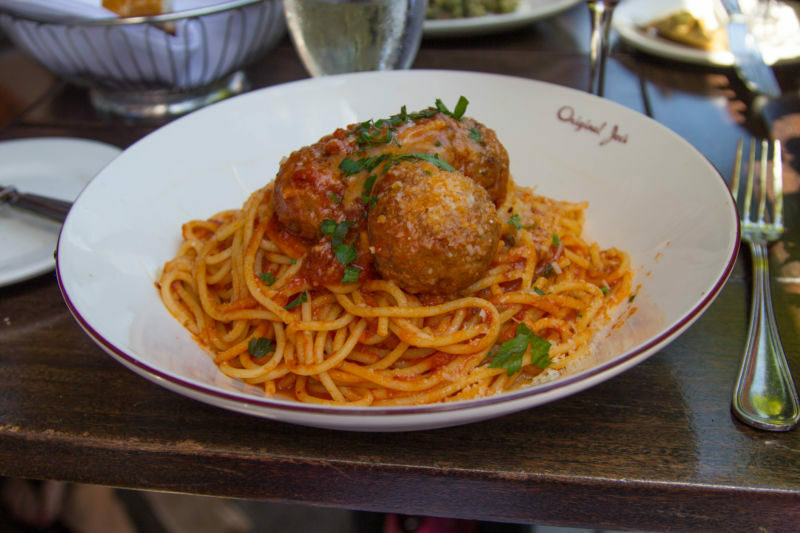 It doesn’t get more classic than spaghetti and meatballs. The waitress insisted it was the best in town. I have to say, she might be right. The marinara sauce was flavorful and balanced without being over acidic, the meatballs were tender and perfectly cooked. The pasta was perfect al dente. The old lady from Italy who taught me to cook would have approved. The Brit comments: Our server was familiar with the menu and recommended the meatballs with enthusiasm. I like it when staff at a restaurant are passionate about the food that they serve. The Brit too kept it classic with his veal parmesan order. Again, this was an excellent representation of the dish. 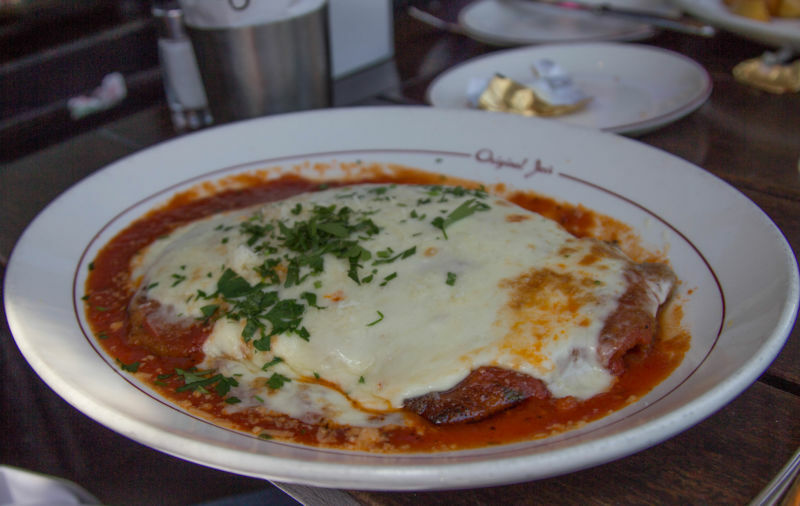 Thinly pounded veal coated in bread crumbs and cheese, fried, and then smothered with marinara and cheese. Tender and moist, I have to give the chef credit, it was delicious. The Brit comments: I avoid eating chicken parmesan as it always disappoints in comparison to that made by California Girl. However, I do not have the same reservations when it comes to ordering to veal and I was very happy with my choice. 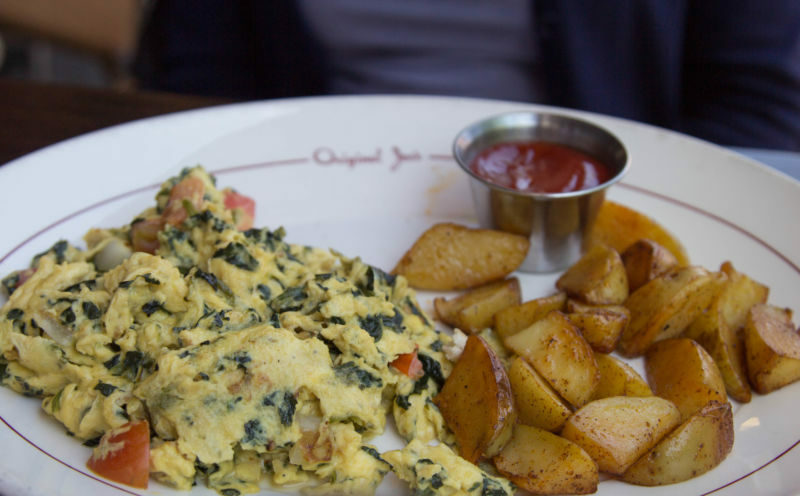 The last two dishes were from the brunch menu. The girls both ordered eggs prepared in different ways. 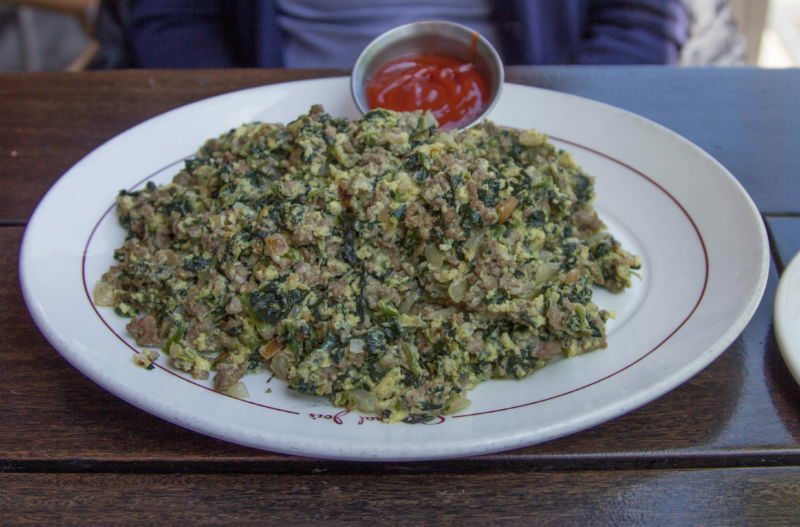 One was Joe’s Special which was scrambled eggs with ground beef, onions, and spinach. This was my least favorite plate of the day. There was just too much meat in there and it drowned out all of the other flavors. It was such a heavy dish, that not much of it was consumed. The other dish was scrambled eggs with spinach and cheese. It was served with a side of potatoes. I really enjoyed the bite of this I had, as did the person ordering it. She was extremely happy with her meal. Of course as we were blogging, we decided to get some dessert. 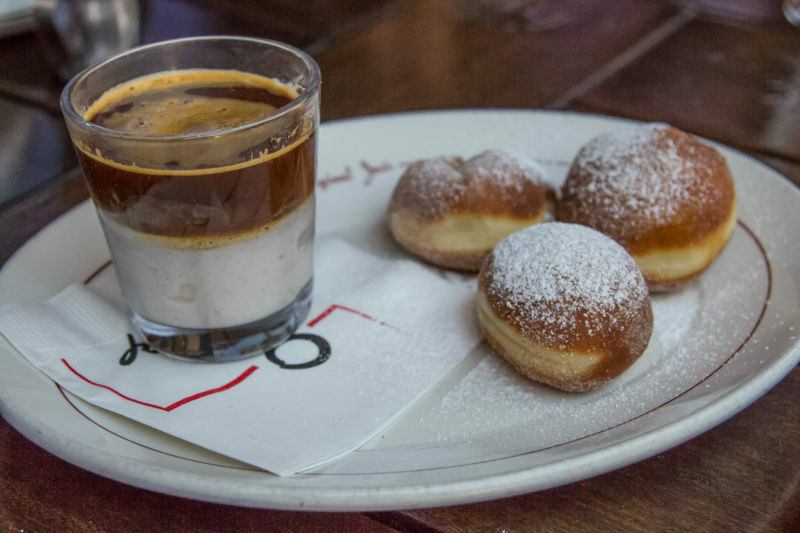 We ordered the doughnuts, affogato, and vanilla bean gelato. The doughnuts were so light, and coated lightly in powdered sugar. The moans of joy at our table had to be heard from across the street from where we were sat. The affogato was good, but I felt the strength of coffee that was served with it overpowered the ice cream. 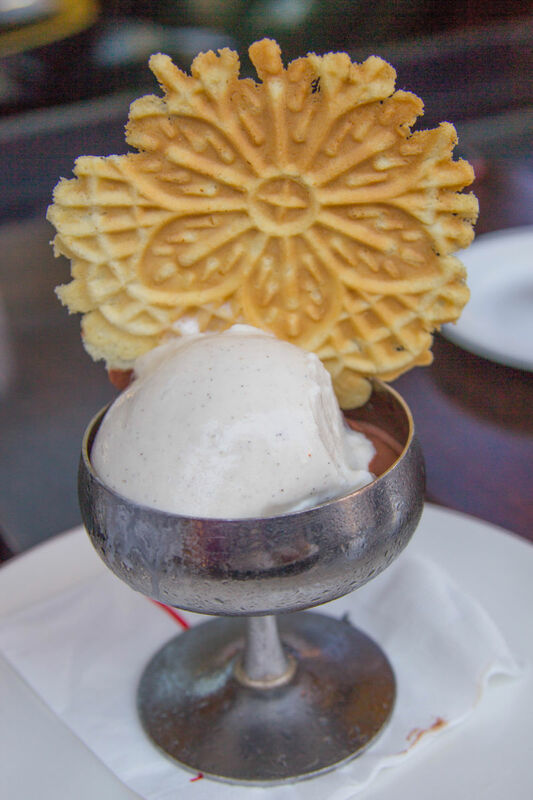 Everyone loved the vanilla bean gelato with its fancy waffle cookie. All and all our meal was a complete success and we all rolled out of there with big smiles. I would love to go back there soon and try some of their other wonderful dishes. I know I won’t be disappointed.